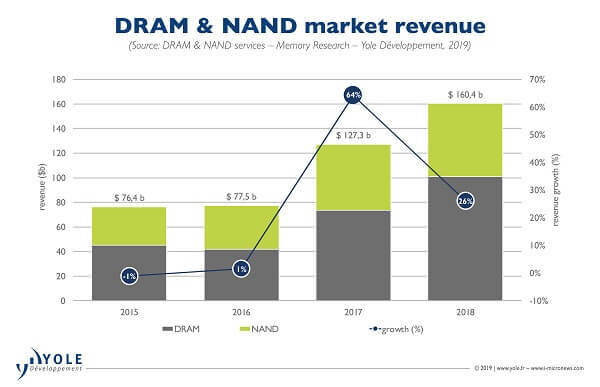 The combined DRAM and NAND memory markets experienced a period of extraordinary growth over the past several years, driven by important megatrends including mobility, cloud computing, AI (Artificial Intelligence), and IoT (Internet of Things). Without a doubt, these megatrends have had a significant impact on the semiconductor industry, especially the memory markets. Yole Développement (Yole) announces a $165 billion stand-alone memory market in 2018, with more than $160 billion attributable to the DRAM and NAND market segments. Yole anticipates that long-term demand, driven by these megatrends, will result in memory continuing to increase its share of the overall semiconductor market. In addition to growing demand, prudent supply management from the industry leaders (e.g. Samsung, Micron, etc.) 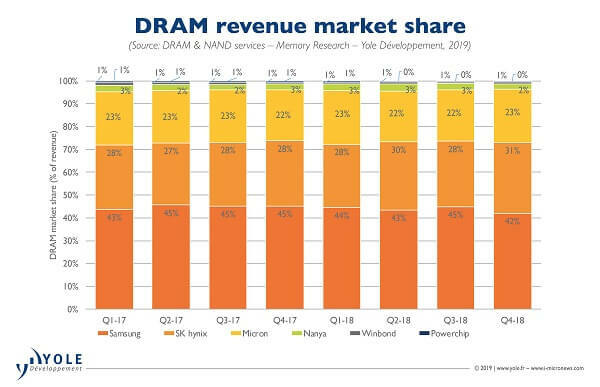 over the past two years enabled combined DRAM and NAND revenue growth of 107%, up from $78 billion in 2016. The prolonged period of remarkable growth for memory came to an end in Q4 2018, with combined DRAM and NAND revenue of $35.8 billion, down 19% from Q3. Both markets experienced oversupply in the quarter caused by unseasonably weak demand, including lower-than-expected smartphone sales and a slowdown in datacenter demand. As a result, ASPs experienced significant declines in both markets and inventory levels increased at the memory suppliers. The DRAM market tumbled dramatically in Q4 2018. Quarterly revenue, which had increased every quarter since Q2 2016 (10 consecutive quarters), fell in Q4 2018, dropping more than 20% to $22.9 billion. Prices fell 10% during the quarter and shipments were down 11%. It is the decline in shipments that was most surprising. The fourth quarter of the year is typically a seasonally strong quarter for DRAM demand but Q4 2018 broke with historical trends due to relatively weak demand in both mobile and datacenter. The weak mobile market was not a big surprise. Handset vendors have struggled over the last few years to offer new features that entice customers enough to upgrade their existing smartphones. 5G is likely the next big feature that will prompt consumers to upgrade their existing handsets and that will not likely happen for another one or two years. Datacenter was the big surprise in Q4 2018. Although there had been signs that datacenter demand growth might be slowing (e.g. inventory builds at hyperscalers), it came to an abrupt halt in mid Q4 2018. The rapid deceleration in datacenter demand caught much of the supply chain by surprise and is the main reason overall DRAM demand is weaker than expected today. The general explanation for the slowdown is that hyperscalers had built out a massive hardware footprint over 2017 and early 2018 and shifted to hardware/software optimization during Q4 2018. This is something the industry has seen before (most recently late 2015) and typically lasts a few quarters. As such, Yole expects datacenter demand (particularly hyperscaler demand) to return in the second half of 2019. Despite the lackluster quarter, the DRAM industry still reached a record high revenue for the year ($101 billion). Revenue in 2018 exceeded the prior record by 38% (the prior record was in 2017 at $73 billion). Prices for 2018 were up 21% compared to 2017 and shipments rose a very modest 14% (far below prior expectations of ~20%). The DRAM oligopoly of Samsung, SK hynix, and Micron remained largely unchanged in Q4 2018 although Samsung did surrender a small amount of market share to SK hynix and Micron. Given the capital expenditure plans for 2019, Yole’s analysts do not expect significant shifts in manufacturing market share this year. Unfortunately for the DRAM market, it looks like there are still several quarters of rapidly falling prices to go before the industry can recover. The first half of 2019 is shaping up to be rather difficult for DRAM suppliers with prices expected to fall nearly 40% by the middle of the year. Given the messy state of the industry, Yole does not anticipate a recovery until 2020. The long-term fundamentals for DRAM remain solid. Although datacenter and mobile demand are weak today, Yole expects a recovery in datacenter in the second half of 2019 and believe that 5G will prompt a surge in mobile demand in the coming years. Is the NAND market close to a turning point? NAND market conditions softened dramatically in Q4 2018, despite Q4 traditionally being a strong seasonal quarter. Revenue was $13.1 billion, down 18% from Q3 2018. Blended NAND prices fell approximately 20% in Q4-18, due to weak demand and excess supply/inventory. NAND suppliers built inventory during Q4 2018, with bit shipments up only 3% in the quarter as multiple suppliers missed their stated bit shipment guidance. Even with a tepid end to the year, the NAND industry revenue set a record at $59 billion in 2018, up 10% from the prior record in 2017. 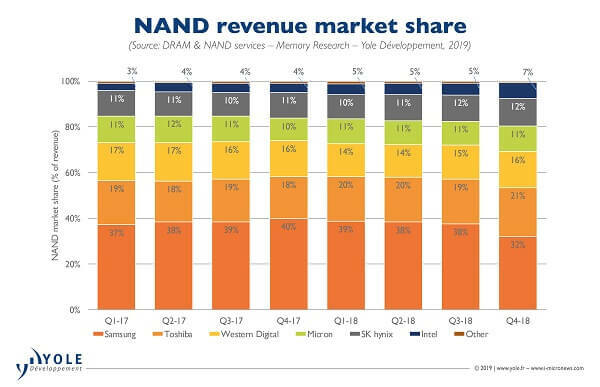 Unlike the DRAM market, NAND was plagued by oversupply for most of 2018, largely driven by excess supply caused by concurrent 64-layer 3D NAND ramps at multiple suppliers. However, the reasons behind the dramatic declines in Q4-18 mirror those of DRAM – weak handset shipments and an unexpected slowdown in datacenter, particularly among the hyperscale players. Samsung remained the market share leader in NAND in Q4 2018, with 32% of the total revenue, despite a significant 6 point drop in the quarter. The company lost share in Q4 as both its bit shipment and ASP declines outpaced the market averages. Samsung has an outsized presence in the datacenter market, and likely faced a greater impact from the Q4 slowdown. For the full year, Samsung led the market with 37% of total revenue. Toshiba (TMC) maintained the second position with 20%, followed by Western Digital at 15%, SK hynix and Micron at 11%, and finally Intel at 5%. The remaining players accounted for less than 1% of NAND industry revenue. Despite a surprisingly weak finish to the year, there is optimism that the NAND market is close to a turning point as elasticity is driving rising NAND storage content across several applications including client SSDs and smartphones. The pricing environment remains soft early in 2019, but conditions are improving as demand begins to recover – there is potential for tight market conditions in 2H 2019, coinciding with seasonal demand recovery and the expected rebound in datacenter demand. On the other hand, all of the major NAND suppliers are carrying significant inventory and will have to carefully navigate optimizing their balance sheets (i.e. clearing inventory) without hampering the expected recovery. It will certainly be interesting to watch how this tightrope balance plays out through the year. The long-term outlook for the NAND market is positive, despite the continued presence of seasonality and cyclicality. Imbalances in supply and demand can cause market volatility in the short term, but emerging megatrends and the ongoing replacement of hard-disk drives (HDDs) with NAND-based solid-state drives (SSDs) are expected to push NAND to new heights. Although both the DRAM and NAND markets have softened dramatically after an unprecedented period of growth, the long-term outlook for both markets remains bright. Calendar 2019 is going to be a difficult year for memory, as suppliers manage rising inventories while waiting for demand to recover. As the memory market continue to evolve, the industry faces many important questions.